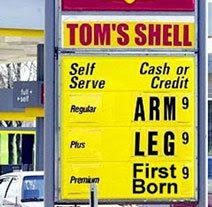 Saving money at the pump requires very little effort, but possibly a lot of self-control. This article that I found on Yahoo! shares how one little change can save you a lot on gas. DEAL ALERT: 70% off at Restaurant.com! DEAL ALERT: 60% off at Restaurant.com--LAST DAY! Washington Post says, "It's cool to be frugal!" DEAL ALERT: Orbitz 7-day hotel sale! Key to buying a used car: CarFax!